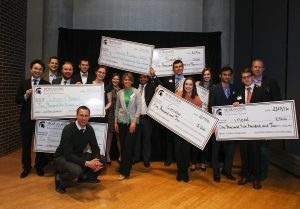 The Broad College of Business hosted the 5th annual Broad Business Model Competition on February 25, 2016. 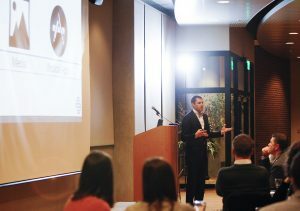 Graduate and undergraduate students pitched business ideas to a panel of judges in hopes of winning a cash prize. Multiple cash prizes were at stake: $5,000 for first place, $2,500 for second place, $1,000 for third place, and two $500 People’s Choice awards. The competition was split up into two divisions: five graduate teams and five undergraduate teams. The ideas presented ranged from social apps to medical products. The first-place winner in the graduate division was Rob Zondervan and his company Steridev, which created the first sterile and disposable phone case that enables doctors and nurses to bring their cell phones and tablets into an operating room. The graduate division’s second-place prize went to Colleen Friel, Jakob Nalley, and Qian Yang, creators of Dispel Chemical Technologies, which offers a chemical blend that removes biofilm and Legionella from industrial and building cooling towers. Spartan Assays—comprised of team members Mark Oliver, Souful Bhatia, and Paula Gajewski—won the graduate’s 3rd place prize by creating a handheld device in which law enforcement can test people for marijuana (THC levels) in 15 minutes. The undergraduate division’s first-place prize (and the People’s Choice award) went to Brittney Urich and Zoe Zappitell, creators of a social app called Conector that exclusively allows college students to interact with one another for social events, study groups, etc. The second-place undergraduate winners (and the second People’s Choice award winners) were Mark Harburg and Helena Narowski, inventors of Safety Sit—a specially designed medical chair that will alter how physical therapy is conducted. The undergraduate third-place prize was offered to Jeffrey Couger, Christian Murau, Shashank Rajagopalan, and David Inwald, the creators of Ineed—an app that finds and delivers products while doing price comparisons. If you were unable to participate this year, Ken Szymusiak, managing director for the Institute for Entrepreneurship & Innovation, encourages students to participate in the future. “There is nothing to risk in getting your ideas out in the open. The competition is a great way to gather feedback to strengthen your plan and you just might take home some well-needed seed funding to help grow your business,” said Szymusiak. In addition to the competition’s volunteer alumni judges Tim Brumbaugh, Investor Relations, GM (Finance 2002); Paul Caragher, President & CEO, Radiant Zemax Holdings (Accounting 1993); and Jenna Kator, Jenna Kator Collection (Advertising, 2000), the Broad College Institute for Entrepreneurship and Innovation is pleased to acknowledge support from the General Motors Foundation for the Broad Business Model Competition.